Turkmenistan, an independent nation since 1991, is a strategically important Central Asian state. This book covers the most significant period of the establishment of the Turkmen political regime. 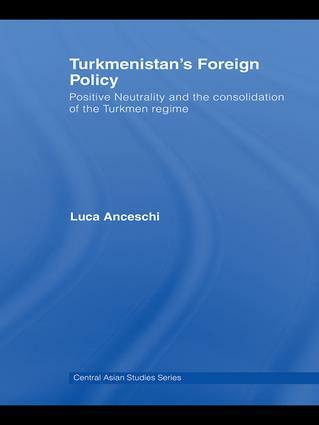 At the core of this book is the Doctrine of Positive Neutrality, which, from 1995 onwards, constituted the theoretical backbone for the foreign policy of post-Soviet Turkmenistan. The author analyses the reason and aim of the concept, its significance for and impact on the country’s domestic and foreign relations, its practical implementation and its transformation into a tool of strengthening of absolute personal authority. Furthermore, he establishes whether Positive Neutrality has to be seen as a ‘domestic-oriented’ foreign policy, which has been used by the Turkmen regime to reinforce its internal position. . This is the first book-length and thorough analysis of Turkmenistan’s foreign policy. It furthers our understanding of Turkmenistan, and provides an informed background for the study of its foreign policy. It fills a void in the current literature, and it will constitute an essential reference for most scholars and researcher focusing on contemporary Central Asia, Russian foreign policy, Foreign Policy, International Relations and Comparative Politics.